This article was written in the spirit of enabling the consumer and jewelry professional to speak in a common language with an understood set of terms. This language standardization is especially important in custom designed jewelry where clear and open communication between the two sides is critical to the success of a custom project. 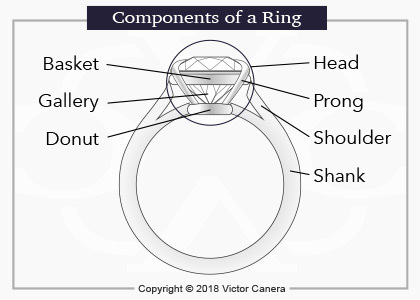 The Head is considered the focal point of an engagement ring because it contains the showcase of a design, its center stone. The head entails the whole structure around the center stone and it includes the “basket”, “prongs” and even the “donut” or “bridge”. The head of a ring can come in numerous shapes and sizes. The most timeless head would be a four prong design yet a head can also include a “halo”, a “bezel” heads and other forms depending on the design. The Gallery typically refers to the side profile of the head of a ring specifically between the basket and donut. The gallery can also include the profile of side accent stones such as in three-stone or five-stone ring designs. The most timeless engagement ring designs feature an open gallery which allows parts of the pavilion of the center stone to be visible. Those wanting a unique touch can have design elements such as filigree or ajour added to the gallery. The Basket is another part located in the head which is also known as a “gallery rail”. These terms are used to represent the horizontal bar that runs parallel to and right below the girdle of the center stone. The basket serves an important structural purpose in ring designs. Without the basket, wire prongs would not have the needed tension to hold the center stone and could simply droop away. We should keep in mind that some designs do not require a basket such as the Gabriella Six Pong Solitaire. These designs don’t utilize wire prongs and are able to generate the strength to hold the center stone from the thickness of the metal at the base of the basket and also because of their wider prongs. Baskets are typically a thin, even bar of metal but they can be embellished by designing them in varying shapes, having them set with diamonds or even engraved. The Donut is the bottom plate of metal at the base of the basket which sits directly on top of the finger. The donut serves a structural purpose as it allows the prongs to have a wider center of gravity which adds lateral stability to a head. This wider center of gravity would make it more difficult to damage the head from a hard lateral force hitting it. Some ring designs do not have a “donut” that protrudes, these pieces have a straight bar of metal called a “bridge” instead. A bridge that is straight underneath the basket is typically done to allow the flush fitting of a wedding band next to an engagement ring. One of the main parts of an engagement ring is the “shank” or band. Jewelers tend to use the term “shank” while laypeople call it a band. These two terms can be used interchangeably as in a split-shank or a split-band. The shank is the circular part that wraps around the the finger. Engagement ring shanks can come in a myriad of designs (Ref 1-2). These different versions of shanks can be further set with diamonds or embellished as needed in an engagement ring design. Additionally most of these shank designs can be done in one of three or more different profiles such as in a cathedral band or a raised band. Equal Width A band design in which its width doesn’t change. Equal width bands can potentially be very thin resulting in an extreme size contrast between the band and center stone. This contrast in size maximizes the visual appearance of the center stone. Tri-Wire Tri-Wire shanks are a vintage inspired design. These types of bands were done by craftsmen in the early 20th century. Due to its antique heritage, a tri-wire band lends itself to designs that combine it with other vintage elements like a vintage halo, a vintage center stone etc. A Tri-Wire shank is an excellent showcase of the advantage of hand fabricated jewelry as cast version can not compare to hand fabricated versions that are constructed with three separate wires of precious metal, hence tri-wire. 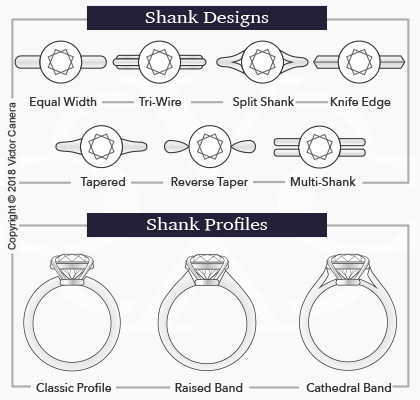 Split Shank Split Shank designs are bands that split apart from each other and taper as they approach the center stone. Split Shanks can emanate from a single, delicate band as in the Anne-Marie Halo Solitaire or they can emanate from two distinct bands that are connected together such as with the Donna Split Band. A split band is a nice way to add a unique touch to a design although they are typically recommended for larger center stones in a solitaire or with halo designs. This is based on the philosophy that smaller center stones can be over-powered by a split band. Knife Edge Knife Edge bands are designs wherein two sides of the band meet at an angle to each other. Knife Edge bands can come in at severe or at shallow angles to each other. Shallow Knife Edge bands tend to be more comfortable due to their lower profile. Tapered Band Tapered Shank designs feature a gradual widening of the band as it approached the center stone. This width graduation results in a beautiful visual that slowly leads the eye towards the center stone. Reverse Taper A reverse taper is a design wherein the band is made gradually narrower as it approaches the center stone. Reverse tapered bands are an excellent way to create a difference in the width of a band yet still allow the center stone to be the showcase of an engagement ring. Multi-Shank Multi-Shanks are designs that have two or more bands that are connected together with a small airline or negative space in between them. Multi-Shank designs typically are done with two bands with negative space in between but three band versions can also be done for larger center stones. Multi-Shank designs are typically wider than single shank motifs. This increased width is therefore an excellent way of making the band more substantial on the finger without making the band appear bulky due to the negative space or airline in between the bands. Classic Profile The height of the shank off of the finger stays constant so there is no variation in height at different points in the band. This band profile is the most common design which results in a timeless visual. Raised Band A raised band adds three dimensionality to a band design by gradually flaring the height upwards of the shank as it nears the center stone. Raised band designs done in moderation can be extremely beautiful at the cost of a slight amount of additional weight to a ring. Cathedral Band Cathedral band designs like raised bands add three dimensionality to a design by dramatically swooping the shoulders of a ring upwards towards the center stone. Cathedral bands are less bulky as compared to raised band designs because of the negative space underneath the shoulders of the ring. Furthermore Cathedral bands strengthen the head of a ring by adding two more points of connection to the basket. This added stability becomes especially important in solitaire designs with large center stones. These above mentioned designs are the vast majority of bands but other designs such as braided shank, twisted shank or infinity shank designs can be beautiful options as well. The Shoulders refers to the upper part of a band as it transitions to the head of a ring. Shoulders often graduate higher in height from the rest of the shank creating a dramatic visual. Shoulders of a design can also be set with diamonds whether they be channel set or pave set with various shaped diamonds. Additionally, the shoulders can form a Cathedral Shank. A cathedral in terms of ring designs is when the shoulders swoop upwards while forming an opening underneath them. The opening underneath the shoulder is typically triangular in shape and helps to keep the design less bulky.